Thanks for the info! These are now both fixed. Cannon plugin and Tipsy Tower 3D template updated, so just download again. @enpu Is it just me, or is the RPG template failing now also, once updated? 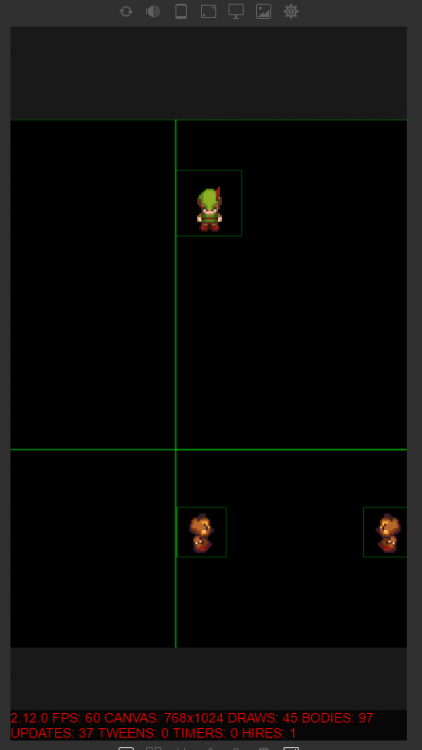 It looks a bit like this for me: No tilemap loaded. I'm on Panda 2.12.0. Don't really have time to debug this, atm, but if someone confirms it's the same for them, I can start to look. There are some rendering issues with TilingSprite and cached containers in 2.12.0 version. Try to update to current develop version, they should be already fixed there. Ugh, and I even read the topic about that bug. Yep, that did the trick, cheers! I did update, but it was the auto-update (when opening a project, Panda Editor suggests I update). I guess that one isn't Dev by update. I manually clicked update, and all is well now. Yeah auto-update only checks for latest master version.